AUGUSTA — In an effort to commemorate the 100-year anniversary of the end of World War I, state officials are hosting a day-long scanathon to preserve and share family-held photos, diaries, scrapbooks and ephemera related to Maine people involved in the war effort 10 a.m.-4 p.m. Saturday, Nov. 3, at the Maine Cultural Building, home of the Maine State Library, Museum and Archives, at 230 State St.
Materials will be scanned on a first-come, first-served basis by trained staff and volunteers. There’s no charge to participate in the program and preregistration is not required. 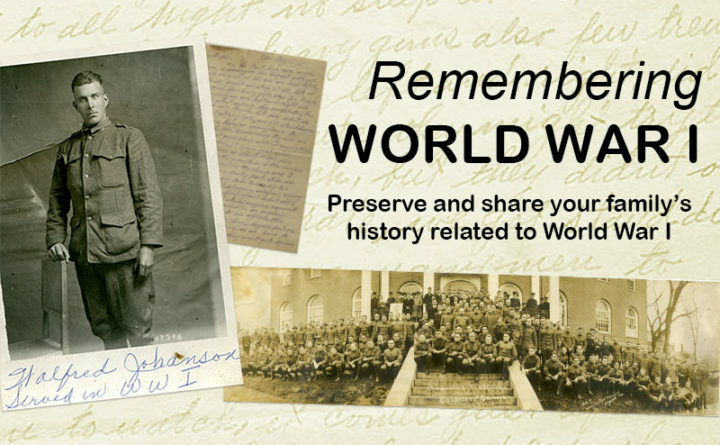 Maine State Library Staff Genealogist, BJ Jamieson will be available to answer questions about resources available to people seeking information about the service history of their relatives. Professor and author Mark D. LeBlanc will be on hand with his collection of WWI materials and will talk about his book, “From Maine to France and Somehow Back Again: World War I Experiences of John M. Longley and the 26th Yankee Division” — a biography of his grandfather who lived in Madison. For information about the scanathon, contact Kimberly Clark at 287-5620.